Marina Jimenez – absolutely intercultural! 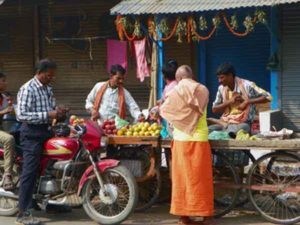 In this show, you will hear about the grocery shop in India and believe me you will be surprised how different it is from European grocery shopping. Hari Gautham Somasundaram Dr. Arvind Sivaramakrishnan and Dr. TJ Kamalanabhan will talk about their own experience grocery shopping in India. In India, you need to go shopping early in the morning to get the best fruits and vegetables from the stalls. Hari, who is a student, tells us that he prefers going to the supermarket rather than the market or buying fruit from trollies in the street. Dr. Arvind, on the other hand, will talk about the challenges of grocery shopping in Indian markets.